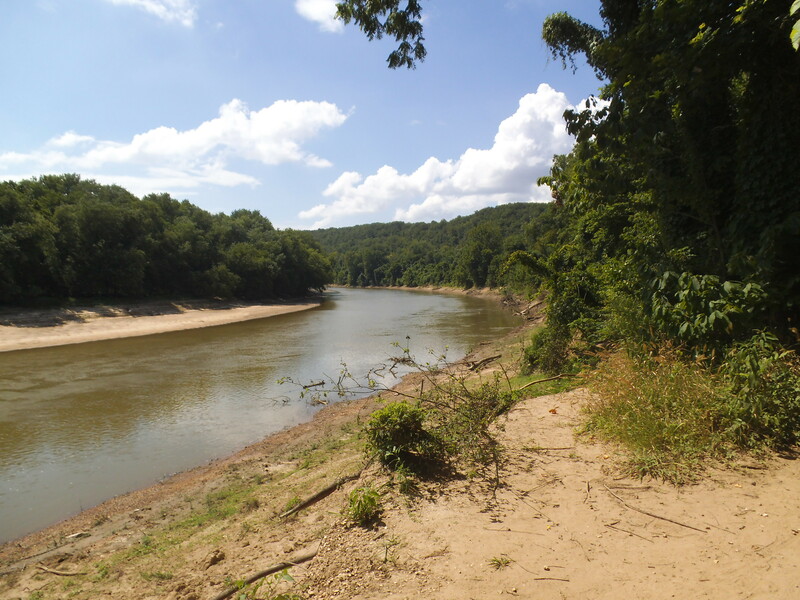 If there is one trail within the general St. Louis area that you MUST hike at least once, it is the River Scene Trail at Castlewood State Park, in Ballwin, MO. 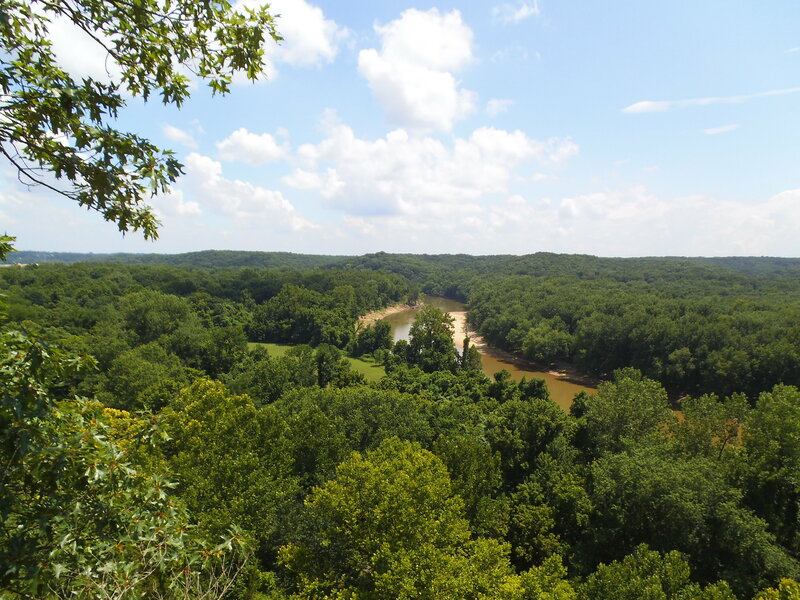 At just over three miles long, it shows off some of the best views close to home, overlooking the Meramec River and surrounding forest from bluffs way up above the flood plain. On this particular summer Monday, it was already moving into the warm part of the day, but I hadn’t hiked it in a couple of months and I needed some good exercise to ease some anxiety and get myself centered, so I filled up the water bottles and Max and I headed out. This was going to get sweaty. There are multiple ways to get to the general area, but the way I take from the 44 and 270 interchange is 44 west to 141 north (right). From there you take 141 a couple of miles to Big Bend Boulevard. Go west (left) on Big Bend. After another couple miles you will come to Ries Road. Make a left on Ries Road. Please use caution on this section, as a trail crosses the road right when you get into the woods. After a mile, at the bottom of a hill the road will end at a “T” intersection. Castlewood will be on your left. Take the park road to the first parking lot on the right AFTER you cross the bridge that goes over the creek. The trailhead is here. So you have a couple of options, to either go up the hill to your right (Don’t go this way. 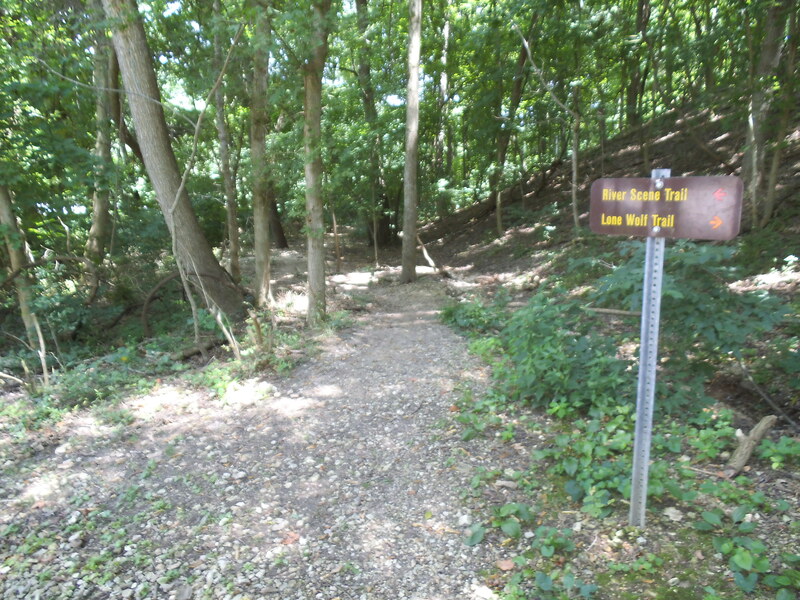 It is the Lone Wolf Trail, and you will miss some of the scenery from the bluffs), head straight along the hill and THEN up, or walk along the road and get the first couple miles out of the way on level ground. 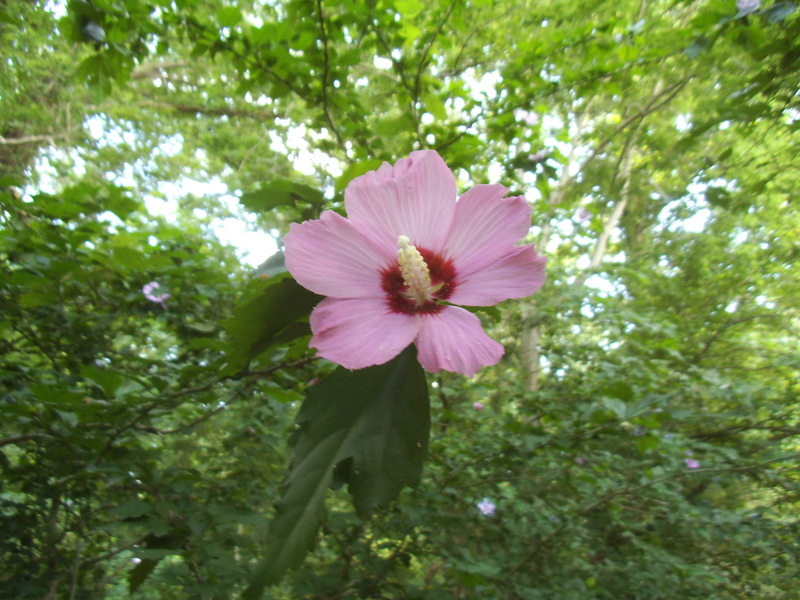 I prefer to walk into the woods along the side of the hill and then head up to the bluffs. This first section, when you start climbing, is pretty rugged and strenuous and you will be amazed at how it doesn’t seem to end, so take your time and enjoy the views as you ascend above the trees in the floodplain below. There are a couple of great spots along here to take a break, some with benches and observation decks, and at around 0.7 miles it levels out for a bit. At almost a mile into the hike, it starts to head back down the hill, and you eventually come to the longest set of stairs I have ever walked up or down outside. When you eventually get to the bottom you will cross through a tunnel under the train tracks, and emerge right next to the Meramec River. At this point the trail starts to head back in the direction of the road, though the vine covered cottonwoods and sycamores of the river bottom. I noticed a bit of Stinging Nettle and Poison Ivy in the underbrush during this section, so it is a good idea to stay on the trail if you can help it. At just about two miles into the hike, you make a right turn and cross a big open field and then back into the woods and next to the river again. However, before you turn right and cross the field, if the climbing wore you out and you are ready to quit, you can maintain the direction you were on and the trail will take you to the park road. You make a left on the road and it will take you back to your car. 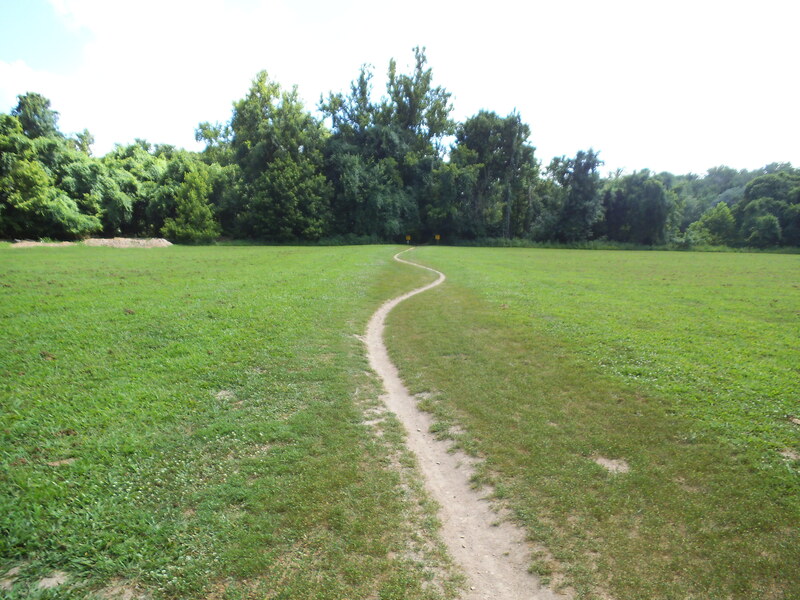 So after crossing the field, the trail follows the Meramec around in a long loop, passing the beach area and the lower parking lot, back into the woods again and eventually turning left to go back to the road. You then make a right turn onto the road and follow it back to the parking lot you started out at. The views from the bluffs are the thing that have always stuck with me since I first hiked this trail years ago. Bring a camera. Make it a point to sit down and take in the breeze and the sunlight and the forest and river below. It can be a meditative experience, if you allow it to. 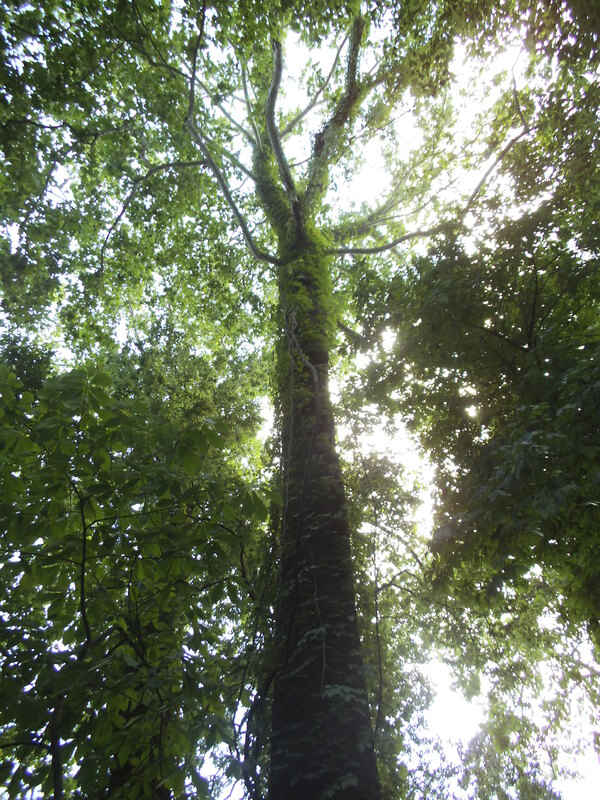 It is a good, satisfying, rugged hike, with lots of up and down at the beginning if you go in the direction I take it. What that means though is that the last two miles or so are on level ground and very leisurely. There are lots of animals in the area, and if you go on a less busy day you will surely see something frolicking around. I don’t think there is a time I’ve gone to Castlewood that I HAVEN’T seen a deer just off the trail a little ways. It is a very gorgeous area, and it is so close to my neck of the woods. 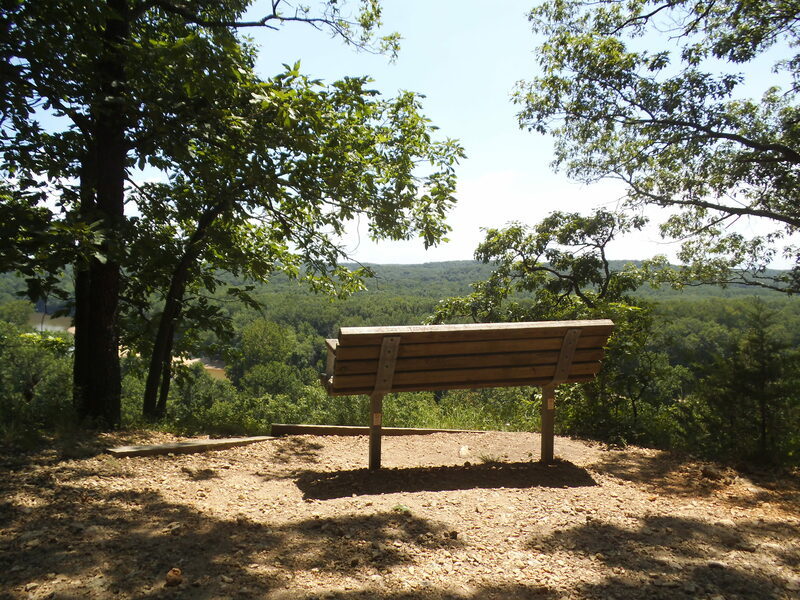 As Castlewood State Park is just south of some of West County’s (St. Louis County) suburban areas, it is one of the busier State Parks in Missouri. On the weekends it can be difficult to find a place to park. As this is a good thing (people being outside and active in nature), if you are looking for solitude this may not be the park for you. Traffic on the trail, especially in the lower areas can be a bit sudden. Pay attention in front and behind you, as bike riders can show up really quickly. Keep your dog on a leash. 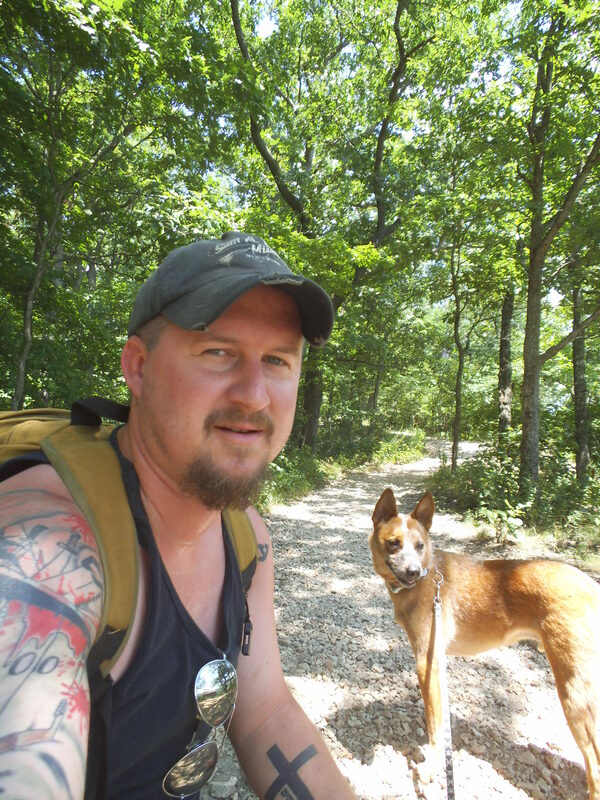 The Missouri State Park policy states that ALL dogs must be leashed…but sometimes I let Max have special privileges when nobody else is around. I do NOT let him off the leash here though, as there are always people and bikes and dogs around. Please, please, PLEASE be careful while on the bluffs. I can recall news reports of people slipping off the edge and down, down, down, to the tracks below. I can’t imagine that was pleasant in any way. Keep an eye on your kids and dogs too. Also, if you happen to go to the park to play in the river, be aware that at least one person per year drowns here. I don’t know if that is due to strange river currents or lack of ability to swim. Again, keep an eye on your kids and dogs. 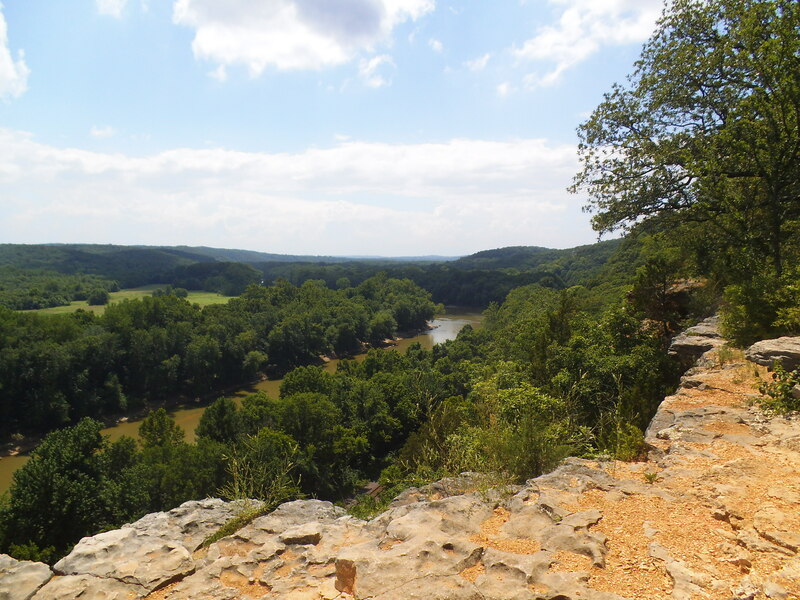 All in all, Castlewood is probably my favorite State Park close to home, and I have been going there for years. The views are beautiful, the forest is deep, the river is alive, and it is a place that many people get to enjoy throughout the year. I try to hike there at least once a season, and it is the perfect place to spend the day. You’re so lucky to have trails like this close to home. I have to drive at least 100 miles to come close to this, and over 200 miles to find rocky bluffs. Yeah, it’s probably within thirty minutes from my house, depending on traffic. I am very fortunate and lucky to live in a land of hills and rivers. They make for a great dynamic together!